First, I needed to locate the box. This was pretty simply since my subnet is setup for DHCP on the 192.168.56.0/24 range. I added the target VMs ip as “target” to my /etc/hosts file and then did a standard nmap service scan. So thats interesting, SSH and HTTP, and an IRC server (maybe) that I cannot connect to. And finally the final clickable link web-page. You can see that Nikto found a file traversal vulnerability, so lets try it out. When trying to visit http://target/?page=../../../../../../../../../../etc/passwd to confirm, I was met with no response from the server at all. A re-run of Nmap did not return anything on port 80, and no new ports. Lets try a scan of all the ports! Host is up (0.000055s latency). 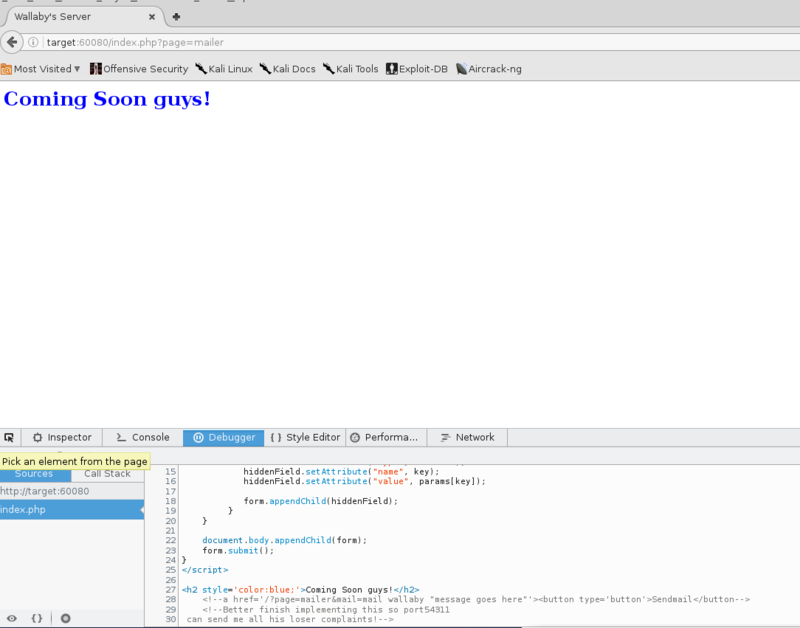 On visiting the website, I am greeted with a new page. There are some definite commonalities between this one and the old one though. It had the same version as the old service, and it seems to have retained my username. Trying out the same vulnerability for file traversal results in success this time! It looks like there are valid users named “walfin”, “steven?”, and “ircd”, but the note about dis-information is pretty odd. Unfortunately though, the next file I tried to view resulted in a patch being deployed. The next tool I’m going to use is dirb. It looks like most of those entries tripped the “patch”. I can somewhat infer the patch is actually just looking for the “/” character. I’ll keep that in mind in-case I want to try and work out another file traversal trick. First though, lets visit the valid pages we did discover: mailer, index, home, and contact. This mailer line is SUPER interesting. mail is a CLI command. I tested it out with an id, and it worked! Oh good! These are the processes related to the IRC server running on the box. I’ll want to check them out when I have a shell. At this point, Im going to try and get a reverse shell into the box. Well since I have control over iptables, lets lower the shields and investigate the IRC server running port 6667. Since the chains were set to default ACCEPT, I just flushed out the rules to let myself in. I want to make an important note here. I changed the channel options to view from 1-9999 users. By default, HexChat only shows channels with >=5 users, so be careful there. Now lets see what the bot can do. You can tell from my screenshot I hit the command-list from guessing. Well, remember I control iptables, which means I can control connections to the machine. This includes 127.0.0.1 local connections, so I can muscle waldo off the server. * [waldo] End of WHOIS list. 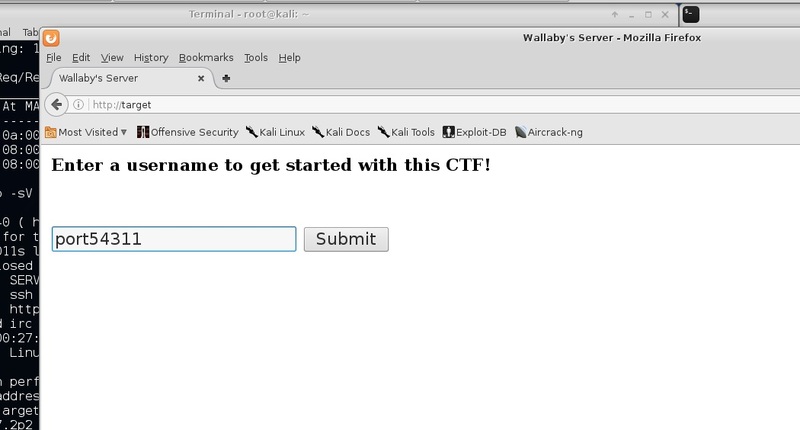 * [wallabysbot] End of WHOIS list. As waldo, I run .run and I get a FileNotFound error from the bot. Well, lets check our sudo and id permissions. www-data@ubuntu:/tmp$ python -c "import os; os.setuid(0); os.system('/bin/bash')"
drwx------  4 root root 4096 Dec 27 19:31 .
drwxr-xr-x 22 root root 4096 Dec 14 19:24 ..